Outline how most Australian and Norfolk Island Government agencies, all private sector and not-for-profit organisations with an annual turnover of more than $3 million, all private health service providers and some small businesses (collectively called 'APP entities') must handle, use and manage personal information. DSD Australia First published in February 2010, and revised for 2014, the Australian Signals Directorate (ASD), also known as the Defence Signals Directorate (DSD), has developed prioritised mitigation strategies to help technical cyber security professionals in all organisations mitigate cyber security incidents. This guidance addresses targeted cyber intrusions, ransomware and external adversaries with destructive intent, malicious insiders, 'business email compromise' and industrial control systems. This guidance is informed by ASD's experience responding to cyber security incidents and performing vulnerability assessments and penetration testing Australian government organisations. ISO/IEC 27001_2013 International ISO/IEC 27001:2013 specifies the requirements for establishing, implementing, maintaining and continually improving an information security management system within the context of the organization. It also includes requirements for the assessment and treatment of information security risks tailored to the needs of the organization. The requirements set out in ISO/IEC 27001:2013 are generic and are intended to be applicable to all organizations, regardless of type, size or nature. PCI DSS 3.0 USA PCI DSS 3.0 (Payment Card Industry Data Security Standard Version 3.0) is the third version of the Payment Card Industry Data Security Standard (PCI DSS) released in November 2013. 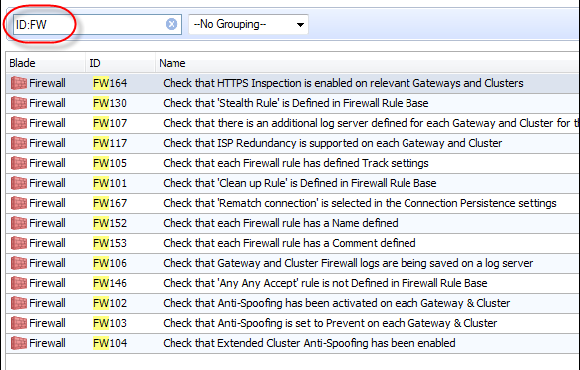 SmartDashboard changes - Automatic scan when an administrator changes objects that have an effect on gateway or policy configuration. 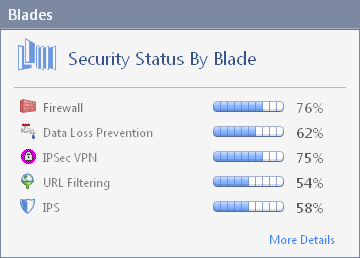 The Check Point Compliance Blade does not have an adverse effect on network throughput or client performance. 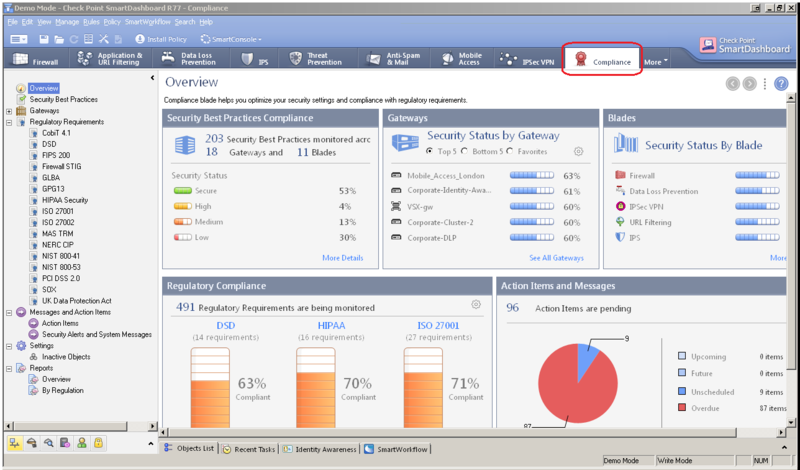 Connect with SmartDashboard to Security Management Server / Domain Management Server > go to 'Compliance' tab. Select the different branches in the navigation tree to see more details. To see all Best Practices, click on 'More Details'. 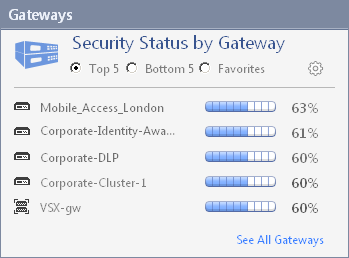 To see the results for all gateways, click on 'See All Gateways'. To see the results for all Software Blades, click on 'More Details'. Upcoming - Action items with due dates in the next 30 days. Future - Action items with due dates of more than 30 days. Unscheduled - Action items without defined due dates. Overdue - Action items that are overdue. Click on the status category, or on 'More Details'. Status - Low, Medium, High, Secure, or N/A. We recommend that you resolve "Low" status items immediately. Relevant Regulatory Requirements - List of all regulatory standards that include the Best Practice test that generated the selected action item. To see the results for all Software Blades, click on "More Details". 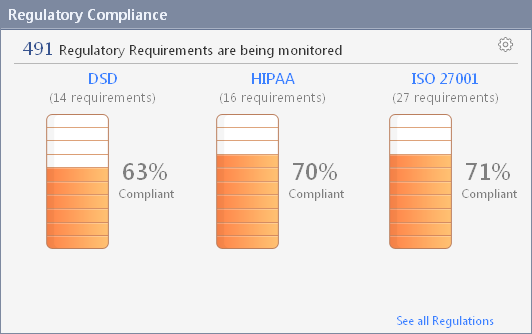 To see the compliance score for all regulatory requirements, click "See all Regulations". The All Regulatory Requirements window opens. Status (Low, Medium, High, Secure, or N/A). 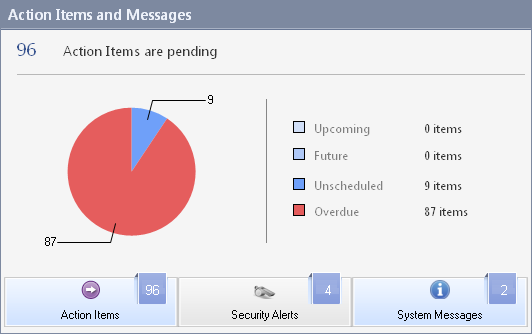 To open the action items for a status category, click that category or its section in the pie chart. The 'Action Items' pane opens. In 'Compliance' tab > 'Best Practices', clear the "Active" option for the Best Practice test. Open 'Settings' > 'Inactive Objects'. De-activated Best Practice tests are shown in the Inactive Best Practices section. Open 'Settings' > 'Inactive Objects'. In the Inactive Gateways section, click the "+" (plus) icon. Click the "-" (minus) icon. In 'Compliance' tab > 'Best Practices', select the Best Practice test. Open 'Settings' > 'Inactive Objects'. The de-activated Best Practice test is in the "Inactive Best Practices on Specific Objects" section. In the Navigation tree, select "Settings". Go to the Compliance tab and expand "Regulatory Requirements". In the navigation tree, click "Settings". Open 'Messages and Action Items' > 'Action Items'. In the Action Item Description section, click "Schedule Now". If the Action Item already has an assigned due date, click "Change" to change it. 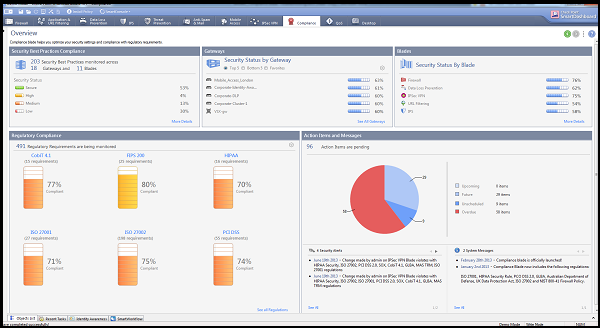 The Check Point Compliance Blade has features that help you to quickly implement corrective steps in SmartDashboard. The Action Items pane shows a helpful description for each Action Item, which gives suggestions to correct the related configuration. You can also correct some issues with the command line. You can correct many issues quickly and easily. For some objects, you can double-click the object in the Relevant Objects section to open its configuration window in SmartDashboard. 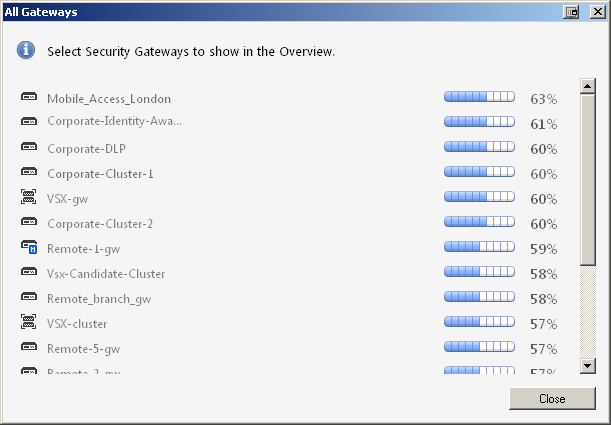 For example, if you double-click a gateway object, the Gateway General Properties window opens. 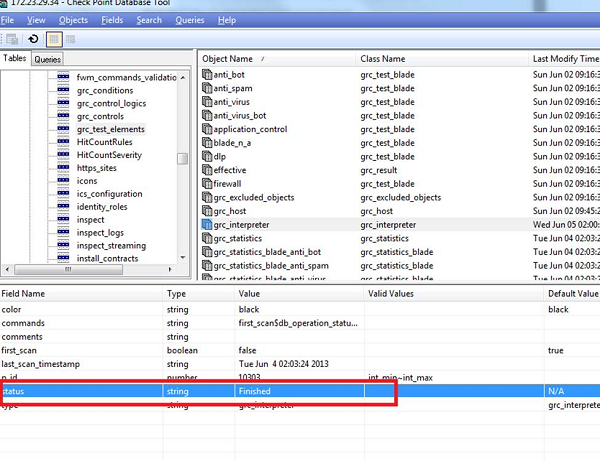 If you double-click a profile object, the General Properties window for that profile opens. 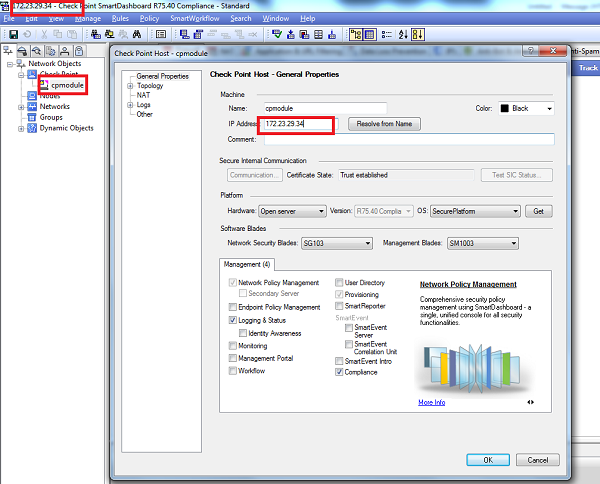 If an Action Item does not have a link to an object, use the description to guide you through the configuration steps. By Regulation - Shows a summary of the regulatory requirements and a detailed list of the Best Practice tests included in each requirement. pane with the report name as the title. Versions: R75.40 , R75.45 hotfix (see sk92470). During GRC Hotfix installation you might get an error message stating that another Hotfix is already installed and that it might be overridden. If you get this message, it is not recommended to select "Yes". If you select "Yes", the GRC Hotfix will be installed and the other Hotfixes might be overridden. If you say "No", than the GRC Hotfix will not be installed. If the customer encounters an issue that had been fixed in the past via a Check Point Hotfix, but appeared again after installing the GRC Hotfix, contact Check Point Support. Check Point Support should be able to get the relevant information either from the cpinfo or from the installation logs (/opt/CPInstLog/*, $FWDIR/log/upgrade_log.elg*). 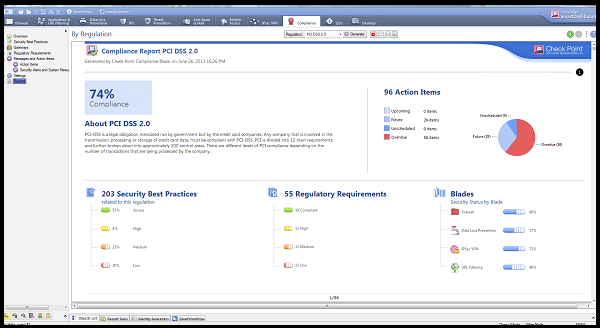 Symptom: In SmartDashboard, in the Compliance Blade tab, you see "The compliance blade is not activated" message, and you cannot navigate in the tab's pages. 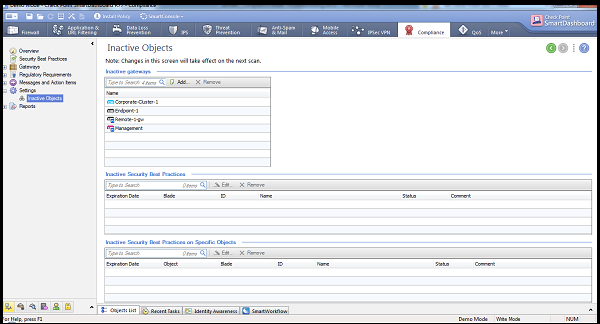 In SmartDashboard, check the Security Management Server object. Verify that the "Compliance Blade" box is checked in the Management Blades section. You can also verify that in the $FWDIR/conf/objects_5_0.C file, the correct value is set. 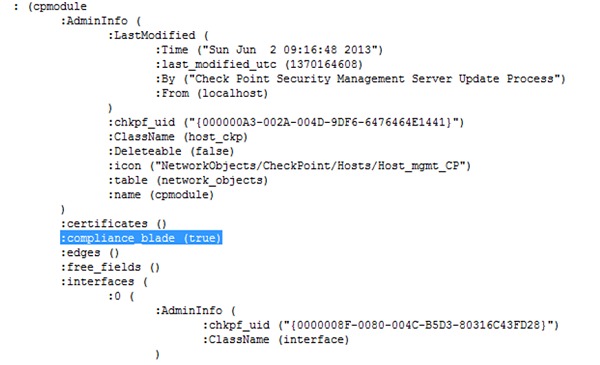 Search for the string :compliance_blade and check that its value is "true". 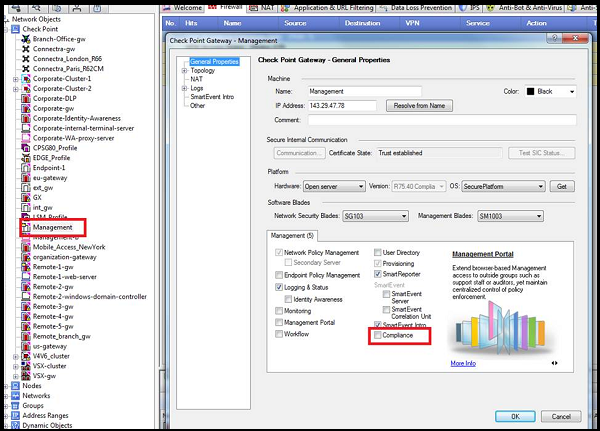 Symptom: If the Security Management Server IP Address that the customer used to login to the SmartDashboard is not identical to the IP Address set on the Management object, there will be problems with connectivity to the Security Management Server. If no license is installed, the user will probably encounter this error message for the first time, when user will try to access the Compliance Blade tab in SmartDashboard. If the customer has Management A with 5 gateways, and Management B with 20 gateways, he needs to buy a 5 gateway license for Management A, and a 20 gateway license for Management B. He can not buy a 25 gateway license and split it between his two Managements. A full scan can take between 2 - 5 minutes. During this time, the SmartDashboard should work as usual. 1366x768 - "Regulatory Compliance" widget displays only 3 regulations, and "Action Items and Messages" widget displays the actual records. Activate by using 3 buttons. 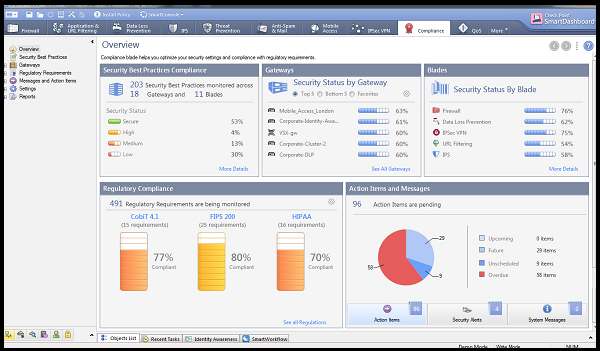 Above 1366x768 - "Regulatory Compliance" widget displays only 6 regulations, and "Action Items and Messages" widget displays all the data with no buttons. The data regarding the "Compliance Alerts & Messages" is a preview (contains short descriptions) and for the full details you need to access the menu items by the link. When setting a date, is there a process being run in the background? No process is being run. The only effect of the due date is the distribution of the statistics in the 'Overview' > 'Action Item' pie chart. How do the Action Items interact with the daily scan? 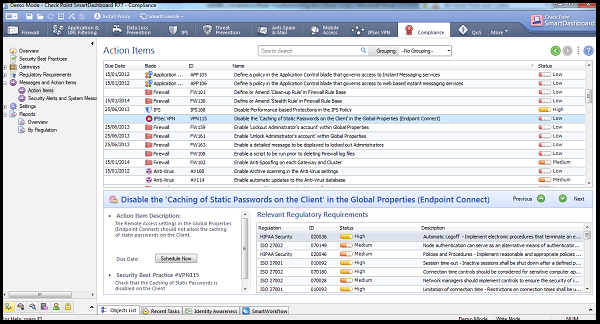 Once a Security Best Practice becomes 100% secure, its corresponding Action Item should disappear from the chart and Action Items screen (in the menu). And the mini-scan? Once a Security Best Practice becomes 100% secure, its corresponding Action Item should disappear from the chart and Action Items screen. If the help text is not loading, what is it being linked to? Standard SmartDashboard help. Not specific to Compliance Blade. 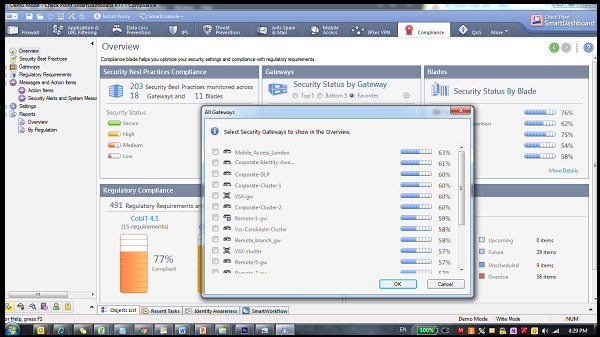 The relevant blade of the Security Best Practice is not installed/purchased on the specific gateway. 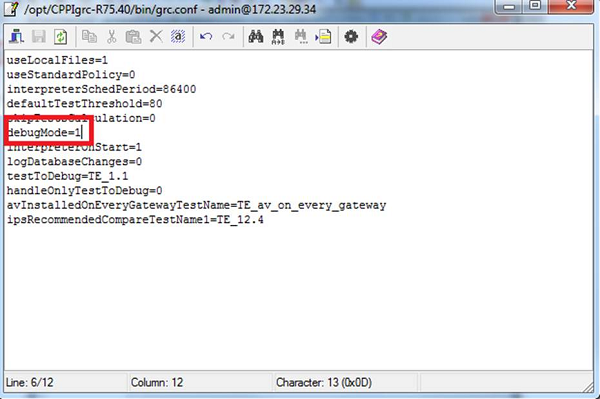 The current Security Best Practice does not support the gateway version. Symptom: When trying to run rescan (from 'Compliance' tab > 'Settings' > 'Rescan'), the status changes to "pending ..." and rescan does not start after more than 20 seconds. Go to 'Compliance' tab > 'Settings' > click 'Rescan'. 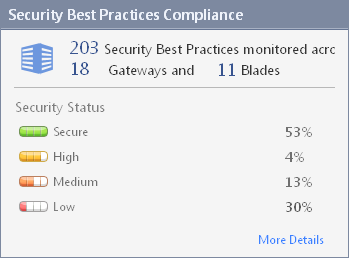 The Compliance blade supports VSX Gateways / VSX Clusters running R77.20 and above. By design, the "Security Best Practices" for "Gaia OS" are not checked on VSX Gateways / VSX Clusters.